While Michael’s company offers a full range of residential design build, landscaping, nursery, and masonry services; landscape lighting is Michael’s most consuming passion. His extensive knowledge of plants and landscape design enables him to see the beauty inherent in the landscape and to visualize how this beauty is best revealed in nighttime illumination. While many landscape lighting installers place lights in obvious locations, Michael excels at finding optimal (often hidden) locations for lights. In this way, he builds lighting designs that are both subtle and dramatic – designs that call attention to the illuminated objects and not the illumination itself. Perhaps the best way to illustrate Michael’s talent is to examine one of his projects in detail (see photo). This upscale Connecticut home features a colonial-style wrap-around porch with square columns and a gently curving stone walkway to the entrance. This project is an excellent example of masterful landscape lighting. 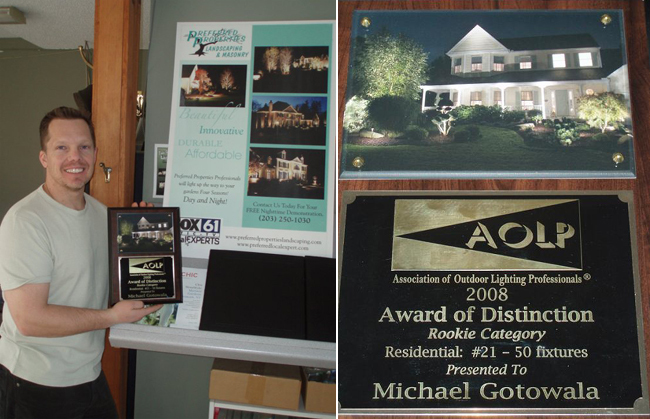 It was featured in several trade magazines and won Michael an Award of Distinction from the Association of Outdoor Lighting Professionals (AOLP). The first impression of the lighting design is the illumination of the columns. This architectural feature should always be illuminated. Columns are dynamic elements in architecture, they take take the eye in a vertical direction, giving an impression of a structure that is both lifted and supported. They also take the eye horizontally emphasizing the breadth and symmetry of the structure. The illumination is therefore critical. You will notice that Michael took care to light all columns evenly from top to bottom and to ensure that all columns are equally bright (note: it was not possible to light the right-hand column because of the intrusive shrub). The fixtures used to light the columns are CAST Solid Bronze MR-16 Bullets. The interior of the porch shows an even illumination due to two light sources – ceiling fixtures (set at low levels) and light reflecting off the underside of the eaves (from the column lighting). This reflected light also illuminates the planting bed adjacent to the porch. The use of reflected light from eaves, sidings and trees is often employed to provide a very subtle low-level illumination to reveal areas that would otherwise be in shadow. The next important element in the lighting design is the path leading from the driveway. This is a feature that needs to be illuminated primarily for safety and secondarily for beauty. To ensure safe passage, the steps need to have a fairly uniform illumination with special attention given to revealing changes in elevation. It is also important that the lighting fixtures not exhibit direct glare (shining into the viewers eyes). All these needs were accomplished by Michael’s use of CAST Solid Bronze Savannah Path Lights. Another important element of any lighting design is cohesion. This refers to an illuminated scene where the various illuminated elements are tied together in a way that looks visually complete and pleasing. Michael accomplished excellent cohesion in this project by selectively illuminating various plants and trees on the property. If he had not done this, these areas would have been in complete darkness – such darkness distorts the impression of the property, exaggerates the impact of areas that are illuminated, and compromises security of the premises. There is a delicate balance between employing too much light (starts to resemble daylight) and using too little light (creates a dark mood); Michael achieves this balance through the careful placement and direction of CAST Solid Bronze MR-16 Bullets to illuminate the plant material. To conclude, Michael Gotowala is a landscape lighting designer who creates exceptional illumination by drawing upon his knowledge of the art and science of both landscape and lighting design.